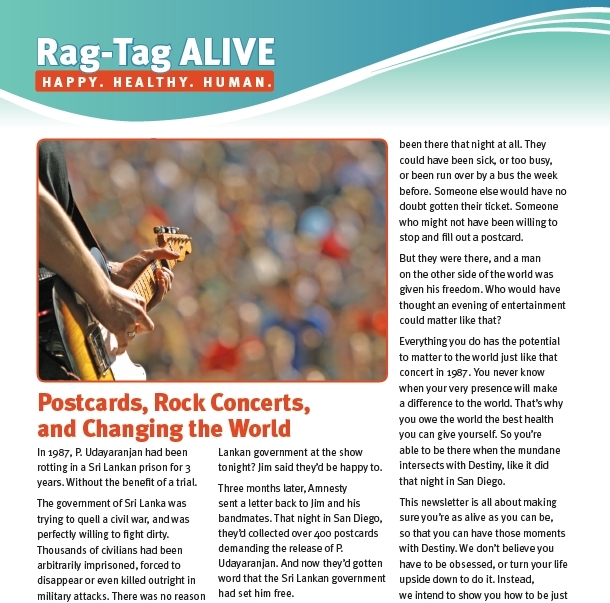 Rag-Tag Elite Members receive each monthly issue via mail as part of their monthly Elite Privileges. (Learn more about becoming Rag Tag Elite here). Individual issues are $19.95 and are available here. 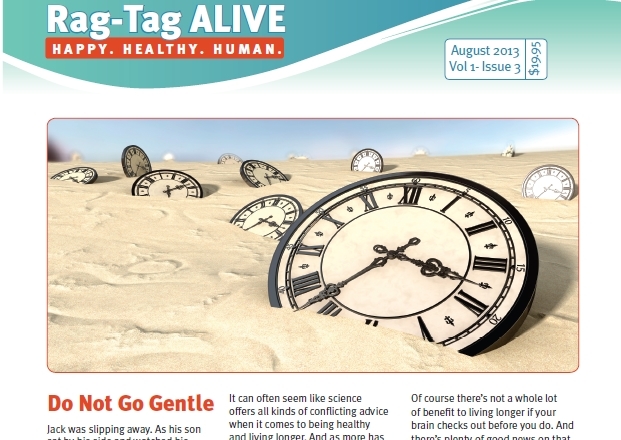 The inaugural issue of Rag Tag ALIVE tackles the basics of staying healthy even though life is hectic. - Why the real enemy is Time, and how every step we take in a healthier direction helps defeat this nemesis! For the last 15 years, science has been looking into what makes people happy. And they've discovered some concrete ways we can all have a greater sense of well-being and happiness in our lives. Is there anything we can do to slow the hands of time? To live longer, healthier lives? Of course there is! The 4 habits that can increase your lifespan by up to a decade! This month we travel to the Mediterranean to take an in-depth look at this simple, yet revolutionary lifestyle that is making big waves across the globe. The Fundamental Principles of the Mediterranean Diet. The beauty of the Mediterranean Lifestyle and Diet is its simplicity and we break it down with Shopping Tips, Sample menus and Recipes to get you started today. She was a well-to-do suburban mom. He was a homeless, traumatized boy. Together they would prove to be unstoppable. A look at how our everyday choices can be the most powerful. Is 'Balance' just another self-help Buzz word and if not, what does 'life balance' truly mean and how do we implement it in our lives? More Energy Now: Strategies to help you unleash your hidden energy well. Balance: One Myth to Rule them all? How Marie Curie followed her passion all the way to a Nobel Prize. November is national sleep comfort month and we’re diving between the sheets to uncover how much sleep we need and the impact a lack of sleep has on our lives. What Not Sleeping Really Costs Us- How our Physcial and Emotional Health is at stake. Losing More Than Sleep - Heath Ledger's death and what we can learn from losing such a talented Actor. The Science of Sleep and strategies to achieve the best rest possible. Counter Clockwise - how implementing a schedule change can saves lives. This month we are taking a look at the ugly underbelly of the holidays : Stress. How do we let it steal our joy and how do we get the magic back? Human Connections: What we can learn from Ernest Brace’s harrowing story of being the longest-held civilian prisoner of war (POW) in Vietnam. Connections for the Time Starved: How to connect with others during the holidays when time isn’t on your side. This month we take a look at the Psychological Barriers that hold us back from living our lives to the fullest. What ‘head trash’ is keeping you from reaching a goal and how do you overcome it? -What’s holding you back: 6 ways to address and change the beliefs that hold us back from reaching our true potential. Your Brain on Mindfulness: How Sitting in Silence for just a few moments a day can alter your life forever. - Rag Tag Research Geeks share their personal stories of overcoming their own obstacles to success.